Do we love fried chicken or DO WE LOVE FRIED CHICKEN? Some friends and I were discussing this rather serious and deeply intellectual topic the other night and we came to the conclusion: YES! Vegetarians excluded, I don’t know one person who doesn’t like this ol’ fav (and if they don’t they’re just telling fibs, right?). It’s crunchy, it’s deep-fried, and it’s oh so tender chicken on the inside. Seriously. Good. 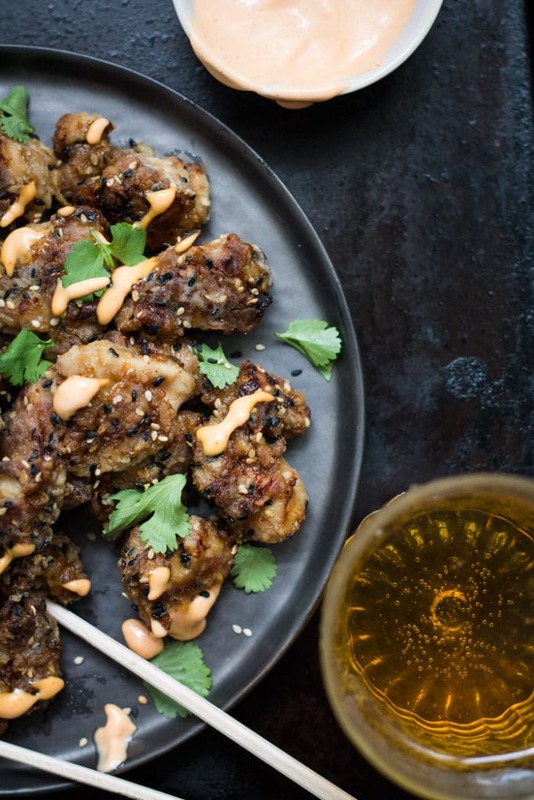 How about fried chicken with a spicy Asian twist? Even better! 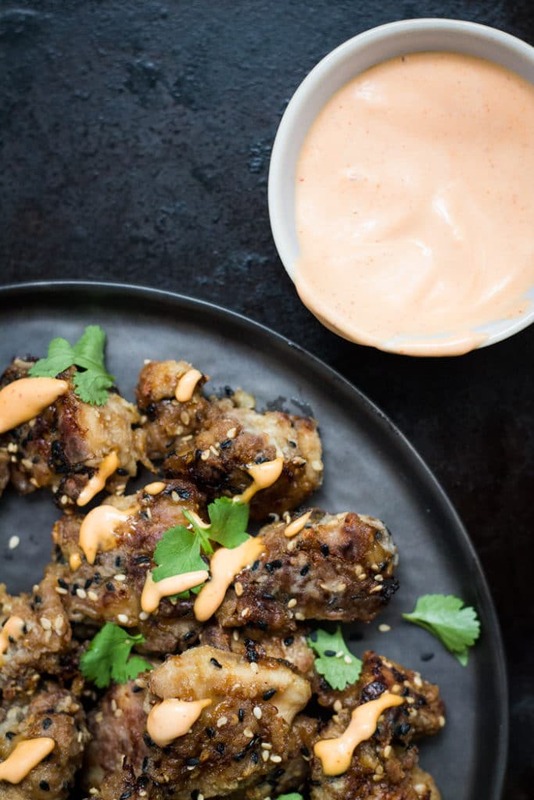 Hello Sesame Chicken Bites with Sriracha Mayo. They are crunchy, they are nutty and they are perfectly spicy little flavour bombs. What’s even better again? Their crispy outside tricks you into thinking you are eating fried chicken but you’re not! It’s totally oven-baked. A couple of weeks ago we got back from a trip to Hawaii. It was so amazing, I did not want to come home. 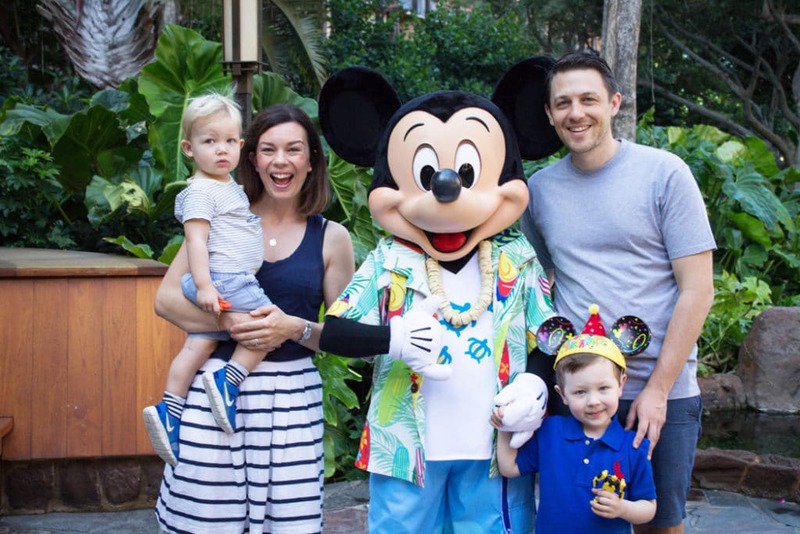 We spent some time at the Disney Resort there where George had his fourth birthday (not sure how we’re going to top that one…ever) and some time on Waikiki. Despite appearances the kids were actually having a fantastic time but it can be seriously overwhelming when you meet your idol! I have the flu in this photo and look terrible, but what better place to recover from the flu than Hawaii? While we were there we stumbled upon this huge Japanese food hall attached to the Ala Moana shopping mall. This wasn’t your standard food hall. It was decorated with flowers hanging off the ceiling and little wooden Japanese-style tables and chairs, which sounds tacky but actually gave it some great ambiance. There was a huge selection of amazing food, well mostly amazing food. We were in Hawaii so there was Spam. Anyone who hasn’t been to Hawaii is probably lost right now thinking what has Spam got to do with anything. Well, it is strangely everywhere in Hawaii. Despite my brain telling me that ham in a can is not going to go down in history as culinary genius, I still needed to try this….and the best way to try this I decided was in…. I know, strange choice. I gave it a go, and while I still love you very much Hawaii and wish I was there right now, I’m not convinced on the Spam situation. Harry my one year old on the other hand may be part Hawaiian. Move over glorious beaches, move over Mickey Mouse, I think this was possibly the highlight of the trip for my husband (I thought it was pretty good too). What’s perfect alongside $1 beers? CRISPY FRIED CHICKEN. Luckily we did lots of walking in Hawaii because we ate A LOT of Japanese-style crispy fried chicken (and cheesecake from the Cheesecake Factory). 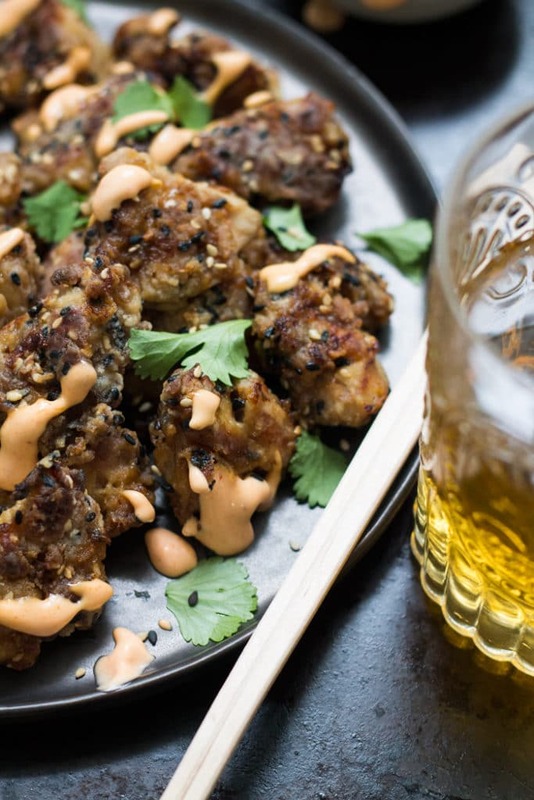 I’ve been missing and craving all that delicious garlic chicken and karage chicken so I decided to make my own version at home, my Sesame Chicken Bites with Sriracha Mayo. The chicken is marinated in all those delicious karage flavours (soy sauce, sweet mirin, sesame oil, garlic and ginger which are flavours you know I am obsessed with e.g. here and here) then covered in a crispy sesame crust. The best part is that it tastes like it’s deep fried but it’s completely oven-baked. So you can avoid all that messy deep frying. Although it’s not really authentic, I love to eat it with lots of spicy mayo for dipping. 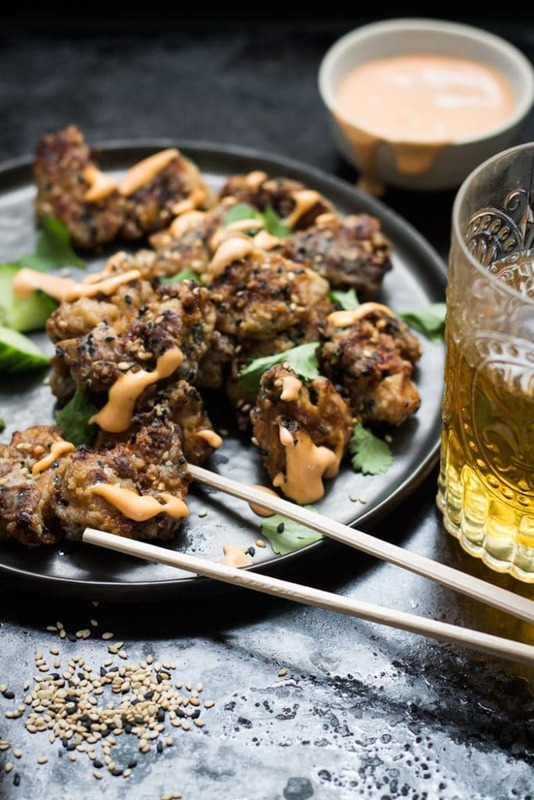 Perfect as canapés (alongside a beer of course) at your next party or equally good on a week night alongside a quick Asian slaw and some noodles…and a beer of course. Serve this up to your friends and family because seriously, who doesn’t love (not-fried) fried chicken? Combine ginger, mirin, soy sauce, sesame oil and garlic in a large non-metallic bowl. Add chicken and toss to coat. Cover and leave to marinate in the refrigerator for at least 1 hour or overnight. Preheat oven to 200C/400F on fan-bake and line a baking tray with baking paper. Place sesame seeds, flour and a pinch of sea salt and freshly ground pepper in a ziplock bag (see note 2). Pick up a few pieces of chicken and if required give them a little shake to remove any excess marinade. 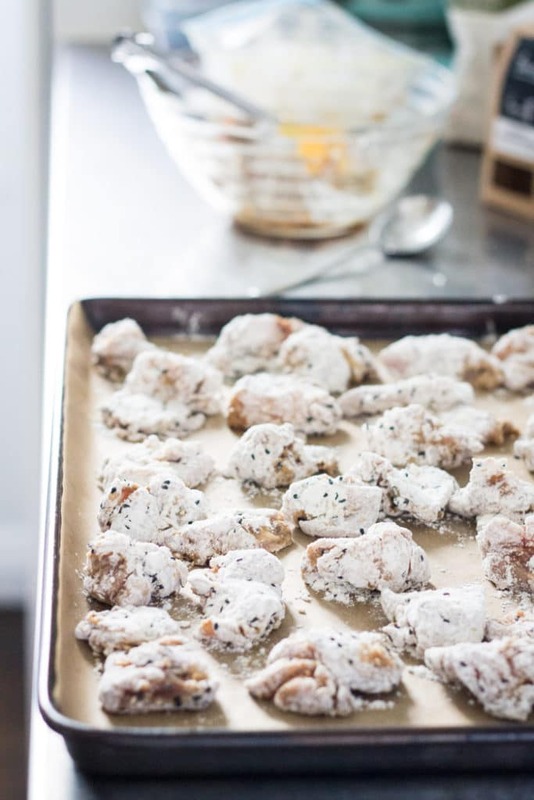 Place in the ziplock bag containing the flour mixture and give it a shake until the chicken pieces are completely coated in flour. Shake off any excess flour and transfer to the baking tray. 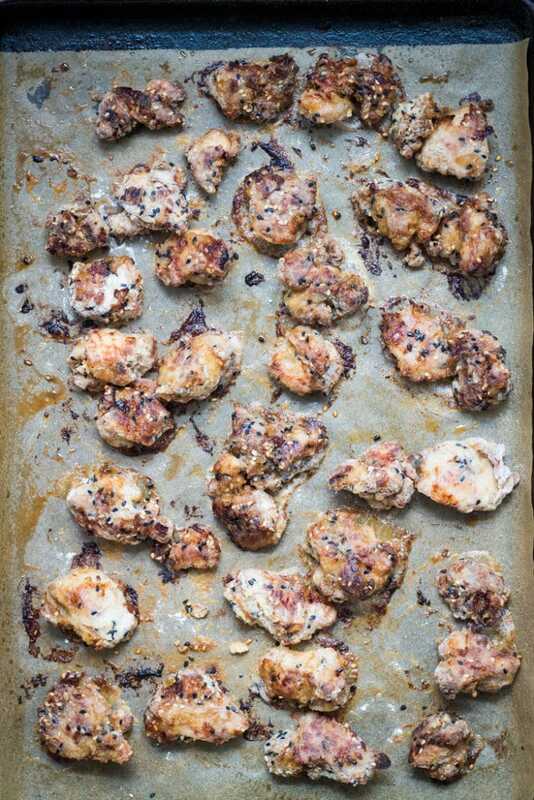 Repeat until all the chicken is coated in flour. Ensure the chicken is arranged in a single layer on the baking tray and it is best if it’s not touching. Take your spray bottle of oil and spray each piece generously in oil. Alternatively, if you don’t have a spray bottle of oil (they are rather cheap at the supermarket though) you can always dip a pastry brush in a little oil and brush each piece of chicken, but I find that sometimes the flour will stick to the brush with this method. Place chicken in the oven for 10 min. After 10 min remove from the oven and turn over all the chicken pieces. Place back in the oven for another 5 min or longer depending on the size of your chicken pieces. While the chicken is cooking make the sriracha mayonnaise. Mix together the mayonnaise, sriracha (1-2Tbsp depending on how spicy you like it) and lime juice. Remove chicken from oven when cooked and serve immediately with sriracha mayonnaise and sliced cucumber. Note 1. Sriracha sauce is an Asian style hot sauce that can be found in the sauce section or Asian section of most super markets. If you can't find Sriracha any Asian-style hot sauce will do, or even a regular hot sauce will do at a pinch. Note 2. I hate to throw away ziplock bags after one use because it is so bad for the environment (yes there's a little bit of hippy in me!). So I turn it inside out after use, wash it with the dishes then either stick it to the window (the residual water from washing it will stick it to it) then let it dry or place it upside down on the bench to dry. Either way it's economical and eco friendly and you get many uses out of one bag this way. Wow, your trip sounds amazing and the sound of $1 beers has certainly sent Hawaii near the top of my “to travel to” places! And would you believe that, a week ago, I would have been lost concerning the mention of spam in Hawaii, but just the other day I listened to a podcast about the history of spam (because that’s what normal people listen to, right?) and it went in depth about it’s history and importance in Hawaii. And now your posts has just confirmed this all to be true ! This has made this particular food nerd a little happy. 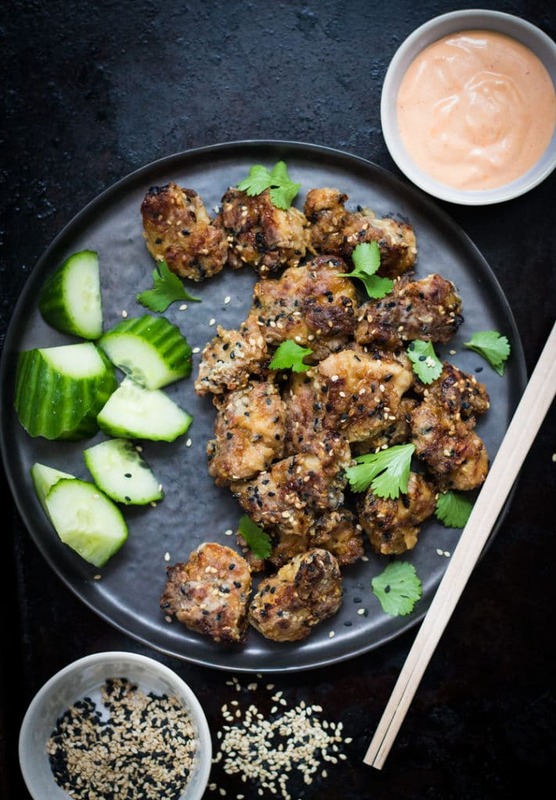 I love the sound of these chicken bites (and I’m in love with your photos!) and the fact that they are oven baked – genius! I had no idea there was a podcast on Spam (I am intrigued! I must be normal too right?). I couldn’t believe there were even burgers at McDonald’s with Spam in them in Hawaii! I am so flattered you like my photos. Since finding your site the other day I have been having a nosey and absolutely adore your photos. If you ever decide to give photography classes you can sign me up!